El Grito del Bronx , the english language drama written by Migdalia Cruz is breathing a fiery life on stage at Portland's Milagro Theatre (now celebrating their 25th Anniversary season). The powerfully moving story of a young woman who as her wedding day approaches must make peace with her past, a abused and sheltered mother, a violent deranged drunkard father and her beloved brother who's descent into madness and violence has cast a haunted shadow over Lulu and her hopes for a future. The memory play feels like a Puerto Rican Tennessee Williams by way of Pedro Almodovar. It's a stunning mix of spectral victims haunting a former-junkie serial killer on death row, dying of AIDS; the domestic comedies and tragedies of first generation American life; and the immense survivors guilt of women whose lives have been irrevocably altered by the violence of men. Christi Miles anchors the entire play with a playful sense of irony that barely covers her crushing self-loathing and fears as Lulu, a young woman torn between her Catholic guilt of her violent past and her longing to marry her nice live-in Jewish boyfriend Ed (played with supreme tenderness by Spencer Conway). Matthew Dieckman (as Jesus, Lulu's brother) gives an absolutely authentic and riveting performance as a soul baring sociopath who's violent ways mask the heart of a sad child. His only steady contact is the kindness of another convicted death row inmate in the cell next door (a compassionate Victor Mack). Papo (as Jesus now calls himself) is tormented by the ghosts of two of his victims , a racist hillbilly gas station attendant ( Kurt Conroyd, who alternates between frightening and pitiable with ease) and his abusive father José (a truly menacing Stephen Lisk). 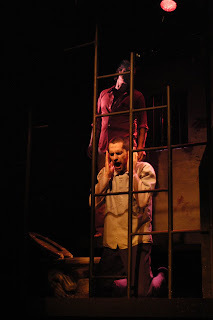 José's brutal death scene is a powerfully intense moment onstage. Three mothers who have all lost a son to violent death create a Greek chorus of sorts adding a complex pathos of the multicultural, multiracial face of oppressed women. Marjorie Tatum, Lisamarie Harrison, and Ithica Tell each in their own specific way paint the painful portraits of mothers who are left to survive beyond their children. The lighting and sound design for El Grito Del Bronx is sublime and solid through out and the direction by Antonio Sonera is strong in keeping with the impressionistic nature of the memory play conventions, at times a soft memory, at others a fever dream. This is a powerful production and a must see if you are in or near the Portland area. Now through April 25th!! TWO-FOR-ONE TICKET OFFER for Thursday, April 9. 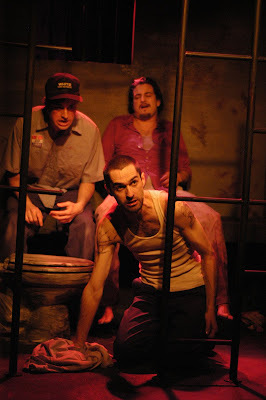 Receive two tickets for the price of one ($20 plus handling) when you use coupon code JUEVES to purchase tickets for the 7:30 p.m. performance, Thursday, April 9 from http://www.pdxtix.net/milagro.